NWMOA has been diligent in Data Security and being compliant with US and other Nations regulations in sharing your contact information as well as receiving email communications from NWMOA on upcoming events and other resources. 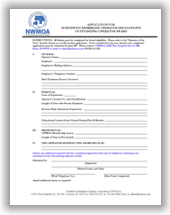 Authorization for receiving publication email notification from NWMOA. Membership is required to attend this short school. If you are not a Member, click here: membership application. 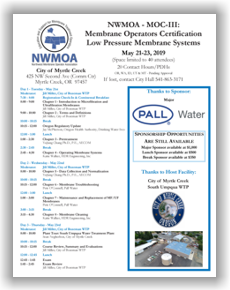 If paying by check: Make checks payable to: Northwest Membrane Operator Association (NWMOA) and mail to: 12592 W. Explorer Dr., Ste. 200, Boise, ID 83713. Written cancellation requests received on or before May 6, 2019 will receive a refund, less a $50 processing fee receipt to NWMOA office of the unaltered MOC Handbook. Without return receipt of the unaltered MOC Handbook the cancellation fee will be $200 (includes administrative processing fee and handbook fee). Full payment is required if cancellation is received on or after May 7, 2019 - no refunds and no credits for future events will be granted. However, substitutions may be made at any time. NWMOA reserves the right to make changes in programs and speakers, or to cancel programs when conditions beyond its control prevail. Every effort will be made to contact each enrollee if a program is cancelled. If a program is not held, NWMOA’s liability is limited to the refund of the program fee only.